You'll be £19.99 closer to your next £10.00 credit when you purchase The Bravest Man in the British Army. What's this? John (Jack) Sherwood Kelly, VC CMG DSO (1880-1931) was a formidable soldier. He fought in British colonial campaigns in the early 1900s, distinguished himself during the First World War at Gallipoli, the Somme and Cambrai, and, after the war, was involved in the British campaign in northern Russia in support of the White Russians. During his military career he achieved fame and notoriety for his mixture of heroic exploits and explosive temperament. 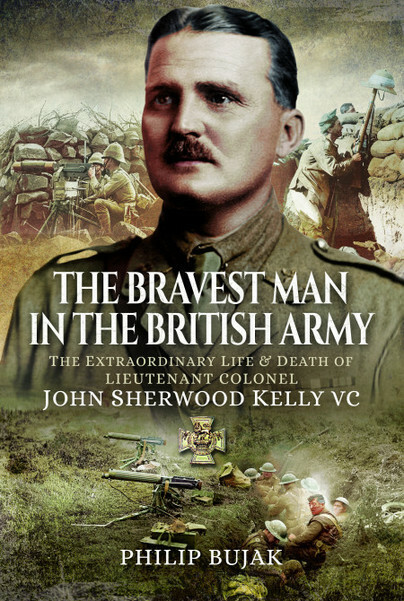 In this meticulously researched and vivid biography Philip Bujak tells Sherwood Kelly's story and gives a fascinating insight into one of the most remarkable and controversial military men of the period. Kelly had a combat record going back to the 1896 Matabele Revolt. He was awarded the DSO for his exploits in Gallipoli in 1916. During 1917 he commanded 1st Battalion, the Royal Inniskilling Fusiliers and was instrumental in the early success achieved during the Battle of Cambrai for which he was awarded the VC. His later service during the British intervention against the Bolsheviks in 1919 ended in court martial and a highly publicized clash with Winston Churchill. The book also uniquely explores how women coped in romantic relationships with men more comfortable in war than in peace and how the men themselves coped with the pressures that emotional relationships brought with them. I first encountered the case of John “Jack” Sherwood Kelly when researching machine gun units involved in the intervention in North Russia in 1918-1919. A man who had a ferocious fighting reputation, and a Victoria Cross for command at a critical juncture at the Battle of Cambrai, would return home in disgrace and face a court martial. How could fortunes change so much? Philip Bujak’s sympathetic biography seeks to find answers. This is certainly the most rounded out account of a very interesting figure. A valuable record of a most distinguished officer. John Kelly’s life and military career were deeply intertwined, pretty much one and the same. This history book pulls back the curtain on the lives of English soldiers just after the dawn of the 20th century. I cannot let the outstanding photography and graphic design of the front and rear covers go unacknowledged, either. Joining the British army as a young man and serving with The Royal Anglian Regiment as a commissioned officer, the author pursued a thirty-year career as a history teacher and headmaster of a girls' boarding school and has written on a number of aspects of military history. Specialising in the First and Second World Wars, he has been researching the life of Lieutenant Colonel John Sherwood Kelly for over twenty years.